If you haven't had enough of the Wowpot, you can now enjoy the all-new, bigger instalment. Click here to play! The progressive is just as massive, but this time you can increase your winning combinations with two extra reels of madness. 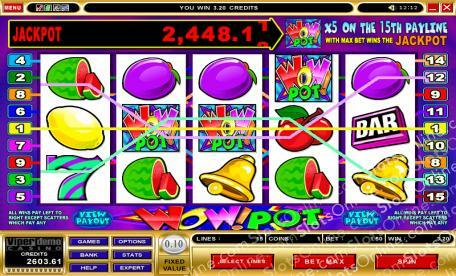 Play Wowpot today, and enjoy the 5-reel, 15 pay line experience. There are no Fun Money players allowed for the simple fact that the massive progressive is so lucrative; however, if you are a Real Money player and in the mood to win big, then Wowpot is the place for you. The Wowpot symbol is Wild and pays out up to 5000:1, while the Scatter symbol can win you up to 300 times your initial wager! If you are the true master of the Wowpot, however, you may end up spinning all five Wowpot symbols on the 15th pay line, and therefore win yourself the entire progressive cash jackpot. Start playing today because the Wowpot is ready to start paying out! The Scatter logo is scattered and will earn you a payout when three or more appear, with up to 300 times your initial wager on offer. The Wowpot symbol is Wild as well as acting as a multiplier. Spin up five of them and you will be winning yourself 5000 times your original stake.